There are so many different ways available to accomplish task management. The number of planners and systems out there can be a chore to sift through. So many times their success depends on your personality and how you handle unfinished plans. I’ve tried several systems in the past and ended up throwing them away. They were often too complicated and I couldn’t stick to them. Or I would give up on my plans if I got behind. 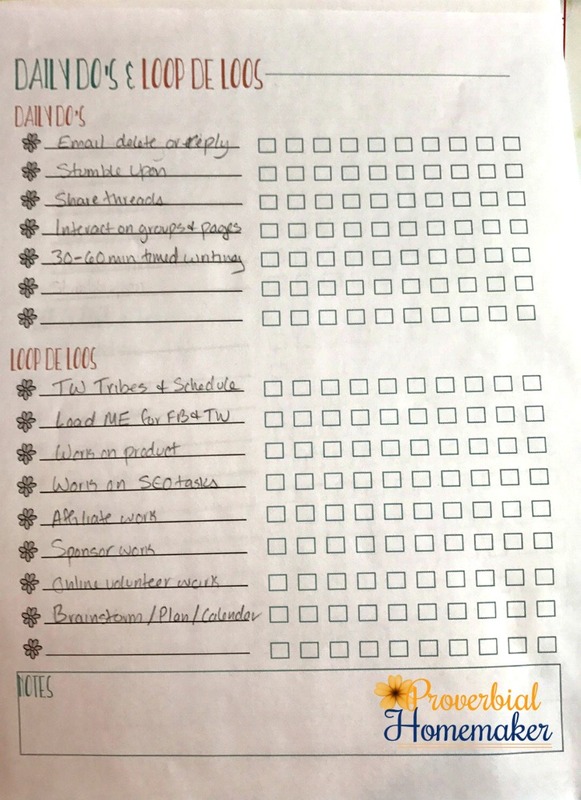 I was always overwhelmed with the sheer amount of work I had to do and it just couldn’t all fit in the day or week, so I fell back into managing the urgent. Then I discovered loop scheduling and my life was simplified. The next day, move on and do the next tasks! When you’ve gone through the entire list, start over! That’s pretty much it! Loop scheduling is incredibly simple, easy to tweak for your needs, and flexible to fit any type of work you need to manage. First, take some time to watch this video. This was originally a FB Live video to give a quick overview of how I use loop scheduling in our home. 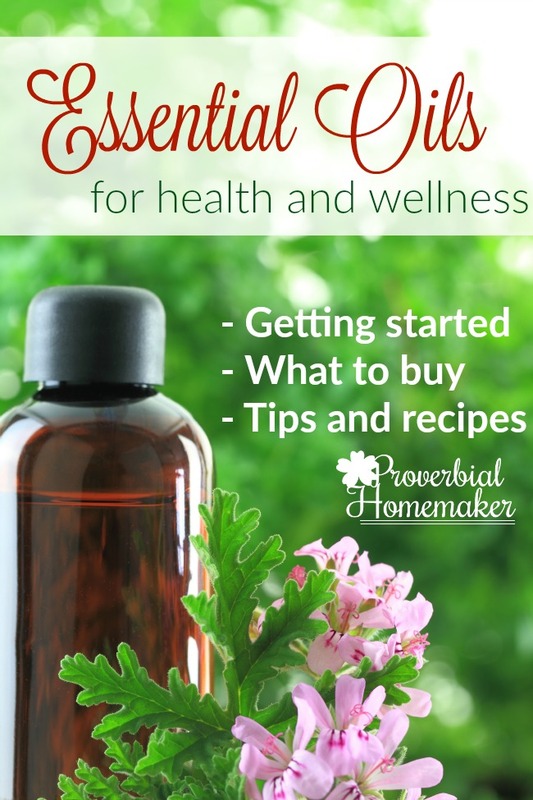 It will give you a quick-start guide on how to use them in your own home and some ideas for how to make it work for you. I have created some simple loop schedule printables for you! Download the loop scheduling printables and then come back here to see how to use them! I tried to show you my latest set of loop schedules (we just had a baby and are just getting back into routines, so they are clean and simplified this time!) but there was a glare on the screen. You can see the examples below. Want More? Enroll in the Loop Scheduling Workshop! 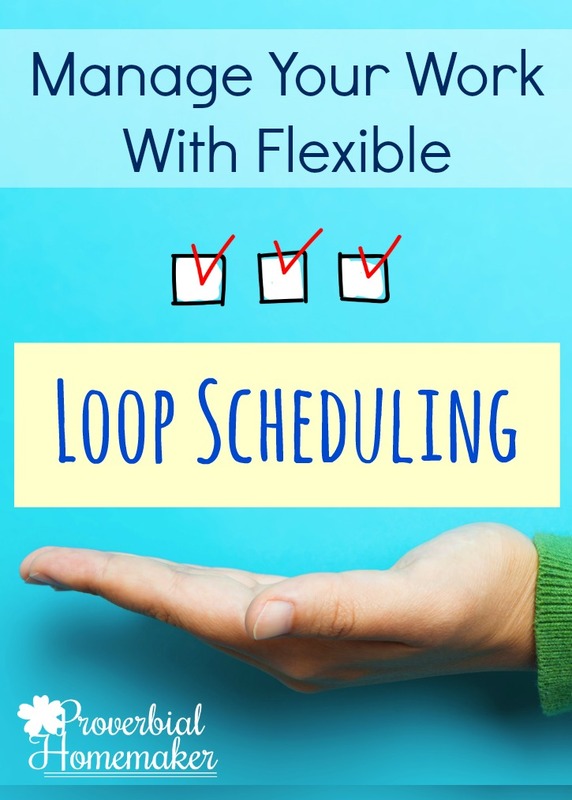 The Loop Scheduling Workshop will provide you with several additional templates to get you started as well as a guide to begin implementing loop scheduling in your home right away! 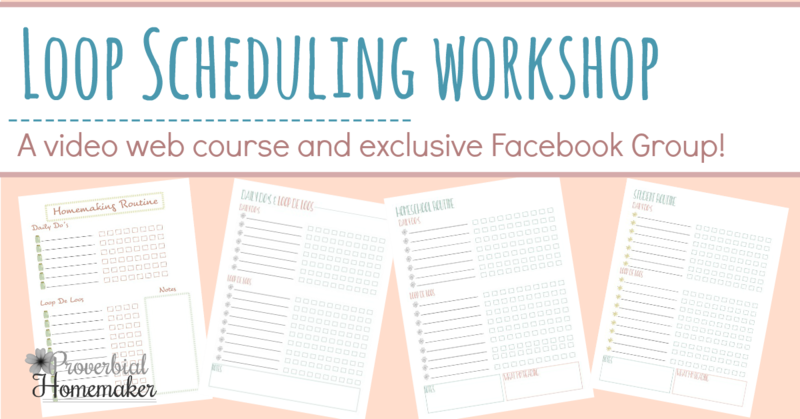 You’ll also get instant access to the exclusive Loop Scheduling Workshop group on Facebook, where you can ask questions, see examples of how others are using loop scheduling, and get extra tips! The perfectionist in me was wanting to type up my daily and loop lists. Then in your video you stated how you reviewed what was working vs. what was not before you wrote out the next one. I love that idea! 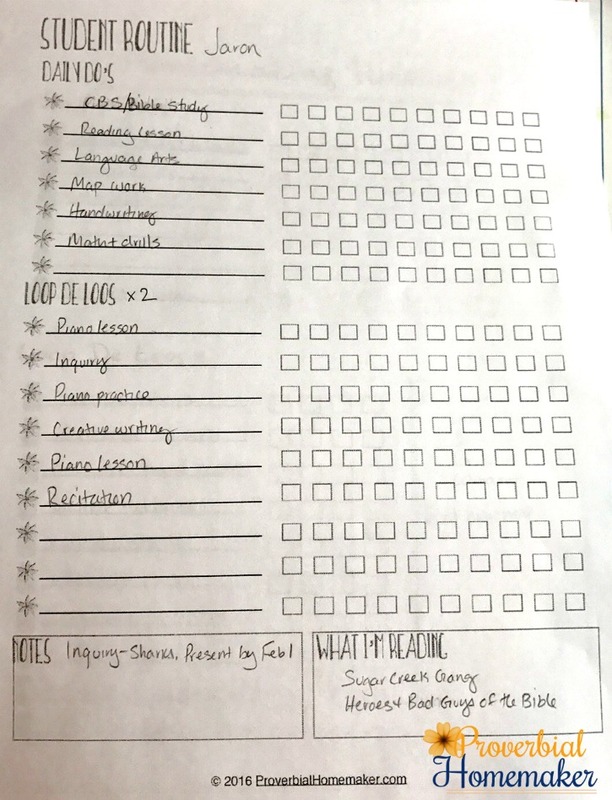 My focus this year is PROGRESS not perfection, so I think the loop idea will help! Yes! That really does help to have that frame of mind – progress, not perfection! It means we’re going places. 🙂 Glad you found it helpful too! I love this idea. I think I’ll begin using it for Ben’s homeschooling and my bogging! Thanks for the video. That really helped! Thanks Marcy! I’m glad you found it helpful. 🙂 Let me know how it goes! I think I’m with you on this one! I sort of do loop scheduling, but your system will be so much more benificial to me! I don’t do well with absolutely rigid, but I also need some reminder of what needs to get done to stay productive without the overwhelm. Thank you so much for sharing! I want to try it for sure! I am a definitely domestically challenged homeschooling mom of 4 (soon 5). 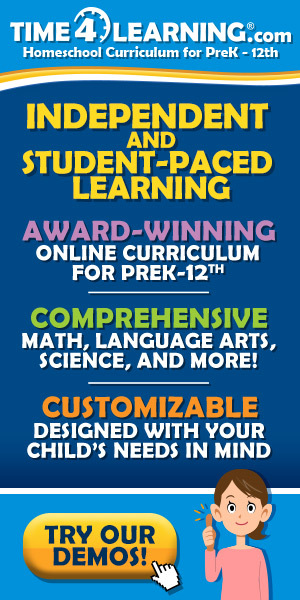 I am discovering your website and loving it! I have already got help and encouragement from it! This loopy thing is definitely something that helps me a lot and that I need to implement more. thank you for replying honestly. Your answer DID help me. In the meantime I also took time to purge my inbox so it is better now. 1. My goal is now that when I look at new emails: I sort, delete or reply. I have 3 folders I can sort incoming emails into: one for optional information stuff to read “one day”, one for commercial offers I may need “one day”, one for information about online orders that I need to keep at least until the order has been delivered/paid/reimbursed. I don’t need to write this on my dailyDos because I look at my emails anyway 🙂 With this my inbox content should *generally* not grow anymore from one day to the next. 2. Then I am putting a “computer maintenance” line on my dailyDOs: to progressively reply to all the older emails in my inbox then progressively purge my email folders and also do other random computer maintenance things when my emails are under control. Doing one thing everyday, progress not perfection! I am really excited about the inspiration your methods are giving me! I am also having a “visual clutter control” line in my dailyDos. Actually it is an add-on loop where I go over every clutter catching area in our home and bring it back to its uncluttered state. I am very visual and visual clutter depresses me big time. I am SO happy to have found a working strategy to keep it under control! Well, in short: thanks so much! Ah, these are FANTASTIC ideas! I’ll be adopting them for myself. Thank you so much for coming back to share with us! Thanks, Tauna! Like you, I realize that I’ve organically developed a loop schedule without knowing that’s what it was called! This gave me some good ideas for how to refine my current system. I rarely comment, so since I’m here I’ll add that I’m blessed by your blog and enjoy following you on FB. Congrats on the newest arrival! 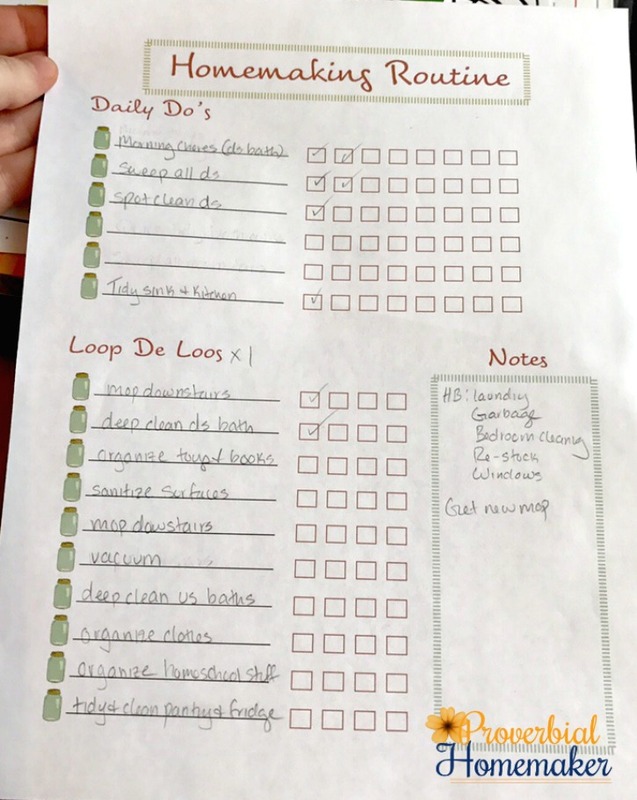 I”ve been looping our schoolwork for a while, but I never thought about using loops with housework and blogging. What a great idea! It is SO helpful! For blogging, too. 🙂 I’m going to try to make one for our new garden this year as well! You are so welcome! I’m always glad to hear when it’s helpful! And I love that phrase “our own brand of order.” Lol! So true! This sounds perfect for me! I am like you…I just don’t do well with the rigid schedule. And once I get “behind” I feel overwhelmed and just stop. 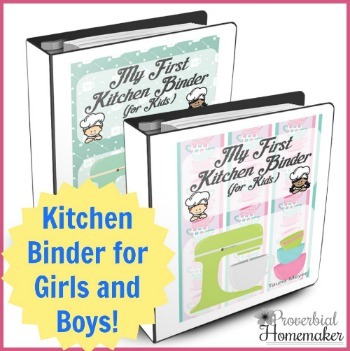 I am hoping this works well for me in both homeschooling and homemaking! You’re welcome, Colleen! Let me know how it goes!